SUBHEAD: A visit to the Possibility Alliance reminded me life can be slow and satisfying. 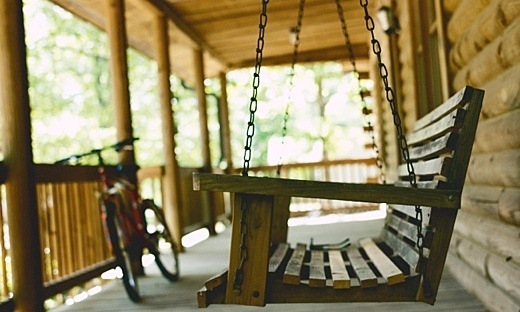 Image above: Porch with swing seat and bike at Possibility Alliance homestead. From original article. I stepped off the train in the farm town of La Plata, Missouri, with my 9-year-old son, Zane. Thomas was waiting to meet us with two well-maintained bikes, one with a trailer for our backpacks, the other with a long wooden seat for passengers, to make the 6-mile trip to the Possibility Alliance. The PA is a 110-acre homestead run by Ethan and Sarah Hughes, who have two young daughters. Their reliance on fossil fuels is limited to trains for long-distance trips, municipal water, and a telephone landline. They purchase bike parts, bulk grains, and tin roofing, as needed—but that’s about it. No electricity, no gas, no cars, no planes. With the imminent release of my book on how life using radically less fossil fuel turns out to be more satisfying, I’d been curious to visit the PA both to glean technical knowledge and—more importantly—to see whether their experience of increased joy and satisfaction matched my own. While my stay was brief, it felt full in terms of the ingenuity, beauty, and love I experienced. The sun set as we biked from the train. A bit later, the land lit up with fireflies. With only candles to light the darkness, the stars and the quiet took center stage. The next morning at dawn, I walked through the lush greens of gardens, orchards, pastures, and forests, then joined Ethan and other members of the community for an hour of meditation. In addition to the Hughes family, the PA is home to two permanent members, Dan and Margaret, as well as two long-term visitors, Thomas and Maggie. Thousands of other visitors have come and gone over the years. A few have settled on adjacent homesteads, while others left to start far-flung urban permaculture centers. All are contributing to a more beautiful and just world, as they feel uniquely called to do. Ethan and Sarah have given away tens of thousands of trees and plants over the years—they are still in awe of nature’s abundance, the way life regenerates and propagates through time, a key difference between a tractor and a draft-horse—but perhaps more significantly, they’ve seeded the world with the people they’ve taught and inspired. Breakfast is a time for community members to check in with each other; this was especially important on the day of my visit, with a dozen visitors due for a weeklong class on post-fossil-fuel living. Ethan shared his disappointment that after a long remission, symptoms of the Lyme disease he’d contracted 15 years earlier seemed to have returned. I was touched by this glimpse of his vulnerability, the intimacy with and reliance on the community he’d helped build. After breakfast, Zane and I milked the PA’s four goats and helped in the garden. Dan hitched the two horses to a sledge and pulled a large log to the woodlot near the kitchen, which one new visitor and I cut with a two-person saw. Not only was the work great exercise, it was meditative and conducive to conversation. I then split the pieces with a maul, a thoroughly enjoyable task. The fossil-fueled wood-splitter might be among the worst inventions ever created. After a sumptuous lunch of vegetable and goat-milk soup, cornbread, and a salad of wild arugula and purslane, Ethan gave a tour that emphasized the deeply interrelated topics of natural building and gift economy. The PA is living proof that both work, and together are indeed more satisfying than modern industry and consumerism. After a dip in the pond and a light supper of leftover soup, Thomas, Zane, and I bicycled back to the train station. The freight trains thundering past every few minutes as we waited for Amtrak’s Southwest Chief seemed somehow just a bit larger, louder, less necessary than the day before. The PA is a success, yet Ethan and Sarah are in the process of moving toward something new. When they acquired the land in 2007, it had met 18 of their 20 criteria for a teaching homestead. The two unmet criteria, however, represent deep personal needs: for Ethan, to live near the ocean; and for Sarah, artistic expression through classical singing. As these needs have called more insistently over the years, these pioneers of sustainability are discovering at a personal level what they’ve long taught others: sustainability begins by listening to the heart—“zone zero” in the language of permaculture. They’re now searching for a community ripe for their vision of transition—someplace near the ocean and with a decent choir. My visit with the Hugheses affirmed what I know about sustainable living. They reminded me also that the one constant of life is change. The Hugheses are restless in exploration of the good life: bold authors of the new story we desperately need. With gratitude, I wish them well.